Pen Name Following his release from prison, the blacklisted writer was forced to use a combination of fronts and pseudonyms to sell his scripts, two of which earned Oscars that he could not accept. "The chief internal enemies of any state are those public officials who betray the trust imposed upon them by the people." The novelist and screenwriter Dalton Trumbo put millions of words to paper in his highly prolific lifetime, but perhaps none come closer to encapsulating his worldview than those. Certainly none in Jay Roach's well-intentioned but ill-conceived biopic. "Biopic" is a stretch. What Roach and scripter John McNamara concocted might better be described as a factually iffy chronicle of Trumbo's life during the roughly 10-year period when he was considered an enemy of the state. He was, of course, one of the "Hollywood 10," blacklisted in 1947 by gossip columnist Hedda Hopper. Seriously. The filmmakers have given history a rewrite. Played as an anti-Semitic hybrid of Liz Smith and a velociraptor by Helen Mirren, the Tinseltown insider is reimagined as a one-woman anti-commie crusade from whom the House Un-American Activities Committee obediently took cues. It's a reworking of the record that's not merely inaccurate but misogynistic. Bryan Cranston continues his effort to leverage the success of "Breaking Bad" into a career on the big screen, a transition that has yielded mixed results. For every hit such as Argo (2012), the actor has missed with a Godzilla (2014). 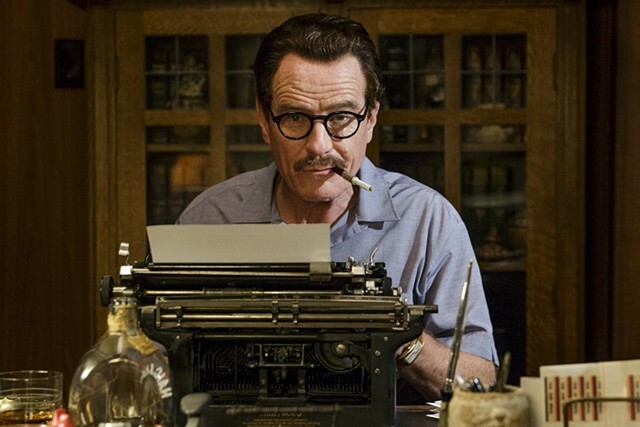 Trumbo features his first run at a leading role in a film. While Cranston brings style and brio to the part, his character rarely achieves three-dimensionality. I wish he'd been better served by his writer and director. McNamara and Roach were hardly obvious choices to introduce a new generation to this historical figure, the politically controversial winner of a National Book Award and multiple Oscars. The former has never written a film before. Roach honed his skills on the Meet the Parents franchise. It's sort of like Michael Bay making a legitimacy grab by adapting Uncle Vanya. The film focuses on the period following Trumbo's refusal to testify before HUAC. He's shown doing time, then organizing a secret screenplay factory in his home, keeping himself and his blacklisted pals from the poorhouse by writing cut-rate scripts under pseudonyms for B-movie magnates the King brothers. Luckily, John Goodman plays Frank King. He's occasionally able to inject a little life and levity into what is otherwise an overacted sequence of speeches and underground meetings. How meh is this stilted, sanctimonious movie? It actually manages to make Louis CK look dull. The comic shows up as a writer who's had a lung removed. His sense of humor would appear to have been extracted as well. It's not quite the fulfillment of the promise he showed in 2013's American Hustle. Did I mention that the real Trumbo moved his family to Mexico after he got out of jail? And that Diane Lane is squandered in the role of his wife, Cleo? To say she channels June Cleaver in this thankless role would be to overstate its depth and nuance. This is the sort of movie that explains its subject's politics to the audience by having him explain them to his young daughter — a device that dumbs things down, to put it mildly. The picture succeeds in reminding us of a shameful chapter in American history but fails to re-create it with any degree of credibility. Virtually all the principals come off as caricatures, the acting is regrettably broad and Roach's lack of experience with drama is apparent in the film's tone, which is all over the place. The bottom line: The man who gave us Roman Holiday, Spartacus, The Brave One, Johnny Got His Gun, Exodus, Papillon and dozens of other well-remembered films deserves considerably better cinematic treatment than he receives here.